Eczema Bulletin, Issue #023 - Is Spirulina Benefical For Eczema? June's Featured Article – Is Spirulina Benefical For Eczema? Is Spirulina Benefical For Eczema? Spirulina is a blue green algae that is found in lakes and rivers in certain places around the world. It has been used as part of a basic diet for many years in Mexico and Asia. Spirulina is known as a super-food. Spirulina can be brought in health food shops. As it has got more popular as an alternative way to help certain complaints you can now buy it in certain supermarkets. It has no reported side effects, so it may be worth giving it a try. If you are pregnant or breastfeeding, check with your doctor before trying it. If you are taking spirulina or have experience of taking it, please let me know as I would love to share them with other eczema sufferers. Bethany Wagstagg is a gorgeous 5 year old little girl, who lives in Surrey, UK with her mum Amy. Bethany suffers from photoaggravated eczema. This type of eczema is aggravated by sunlight. Exposure to sunlight and heat causes her skin to blister and burn. Her mum Amy tells her story of how painful the eczema can get. When at it's worse she would have to wrap her up in bandages to stop her scratching, to prevent infection. She also explains that strangers shout abuse at her and Bethany. She has even been accused of burning her daughter, and has been called a bad mum. One thing that massively helps Bethany is a 'Wrap E Soothe' body suit. It stops her from scratching and prevents the eczema from getting worse. Bethany needs a new suit every 9 to 12 months as she grows. With each suit costing £100 each, Amy is currently trying to raise the money to buy a new one. You can read Amy and Bethany's story here. What I loved about this story is that you can see what a happy little girl Bethany is, despite of everything that she goes through. Tip Of The Month - Eczema or Ringworm? Eczema and ringworm can look quite similar. They are caused by very different things, but they can both be extremely itchy. It is important to get the right diagnosis so they can be treated properly. Both conditions are more common in children, but can affect you at any age. And both can appear on any part of the body. Ringworm thrives on moist skin, as having it around the groin is common. 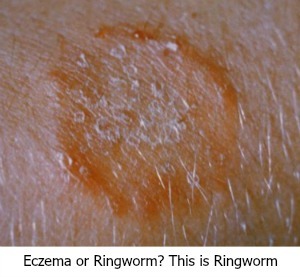 Ringworm can look like nummular eczema. The main symptom for both is the circular red plaques on the skin. Ringworm is caused by fungal infection, and definitely not caused by any sort of worm! This means that it is contagious, as it can be passed from person to person. One way it can happen is from sharing things like towels and bedding. Eczema is not contagious at all. The symptoms are made worse mainly by being aggravated by allergens and irritants. One reason to get the correct diagnosis is because although eczema can be treated well with topical steroids, they can make ringworm worse. A mild case of ringworm can be treated with antifungal cream or tablets. 1. Keep a stock of medicines and creams. Whether its emollients or antihistamines that help you with your eczema and allergies, keep a small store of the products with you. You can carry them either in your bag, or keep them in your desk. I'm constantly moisturising my hands at work, though have found that creams work better for me because after applying an ointment I cant touch anything for a few minutes! 5. Avoid air conditioning. Easier said than done in some places of work. Sitting right under a blowing air vent can cause havoc with your skin. You can ask if you can move to another desk. Or you could speak to your boss about having the windows open instead of having the air conditioning on. Reducing the effect of air conditioning is more difficult to solve. The first four suggestions are things that you can do yourself. Air conditioning tends to affect an office or workplace full of people. Its difficult to make everyone happy!